Our Professional bee technicians safely remove your bees to our bee farm. We inspect your bee problem, provide a written estimate, and remove your bees the same day. We remove bees, hives, and honeycomb from property and structures, both residential and commercial. Bee Specialist removes wasps, too! We do repairs and bee-proofing exclusion to prevent future bee problems. We warranty our work. Discounts to seniors, public service employees, veterans & military. 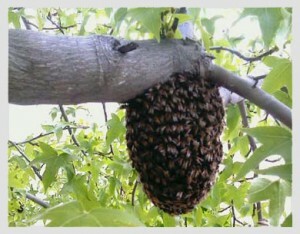 Live bee removal in Oxnard, Port Hueneme, Ventura, Camarillo and all of Ventura County. We relocate hives to beekeepers in our beekeeping network. The hive logo and image pictured on this site is a trademark of Bee Specialist.